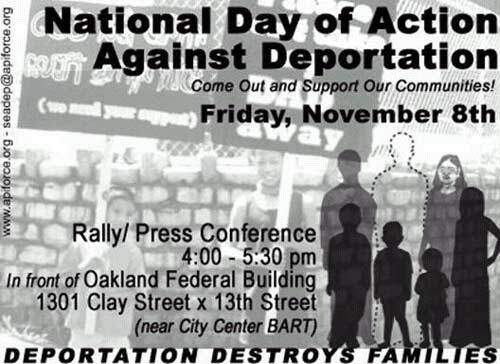 Those of you who've seen my cartoon about the forced deportation of Cambodian refugees might recognize the family in the lower right corner of this poster, courtesy of SEADep (Campaign Against Southeast Asian Deportation) at API ForCE (Asians and Pacific Islanders for Community Empowerment). Anyway, I got a nice letter from some folks at SEADep about the cartoon asking if they could use part of it in some of their literature, so I was of course happy to see this image. Although this particular poster is for a rally in Florida, there will be "sister actions and fax jams in Oakland, CA, New York, Philadelphia, Madison, WI, Lowell/Boston, MA, Providence, RI, Long Beach, CA (Nov 7) and other locations. For more information contact seadep@apiforce.org." "Mikhaela Reid's cartoons are right *$%@ing on." "Mikhaela Reid rocks!! She's where i steal most of my ideas from!!"